Over 182,000 women were diagnosed with Breast Cancer in 2008 and over 182,000 stories could be told. This is just one of those stories. My BFF Glenda drove me and stayed through the morning. The nurses and technicians in the infusion room were wonderful. I did not have an allergic reaction to the poison drugs of choice. Husband Mark brought me my favorite lunch. The surprise of the day came that afternoon when I awoke from a nap to hear a nurse say, "Alice? She's right over here". I looked up and saw a stranger, but when she said "Hi", I recognized my friend Dolise. We had only previously talked by phone - she was a former patient of Dr. Spiegel's and had become my mentor when I was deciding upon the DIEP Reconstruction. She had brought me a care package filled with goodies - I couldn't believe it. Shortly after she left, it happened again. This time it was Laura, another Dr. Spiegel phone/mentor friend & angel - she too had brought a care package! (I learned that's the kind of thing cancer sisters do for one another.) How wonderful to finally meet them in person. The day that I had been dreading had been turned upside down. Before I knew it, my friend Kay arrived to drive me home and I left the infusion room that day feeling like a queen, and very blessed. 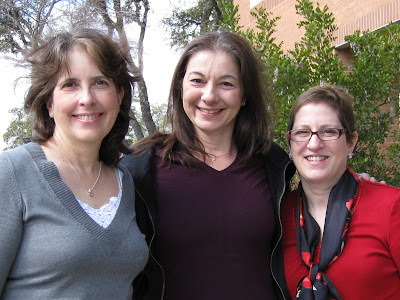 I treated them to brunch a week after my first chemo! After I found the cyst on October 1st, I was not allowed to exercise. Third, 6 more weeks of recovery after the mastectomy/reconstruction. Before Christmas, January 21st was my "Exercise Release" date from Dr. Spiegel and I had been looking forward to a run. With the change in my treatment plan, I was not about to let getting chemo the day before stand in my way. Karen, my friend and running coach, told me about a new running class - it started the 21st - perfect. I knew about the positive effects of exercise for those going through chemo. plus I looked at this as the first step in regaining control of my life. I took it easy, doing some of the warm-up and then managed 1-1/2 SLOW miles around the track. It felt free and liberating! The second day after each treatment was always the worst, I called it Puny Thursday. Thank goodness for the advancements made in nausea medication however, because I never had to hug the toilet. I just had no appetite and a queasy feeling that lasted for 36 - 48 hours. The first Friday afternoon I felt good enough to go on a 12 mile bike ride. For the rest of the 2 1/2 weeks of recovery, things went back to normal as I waited for treatment #2. This was taken on Puny Thursday #4. 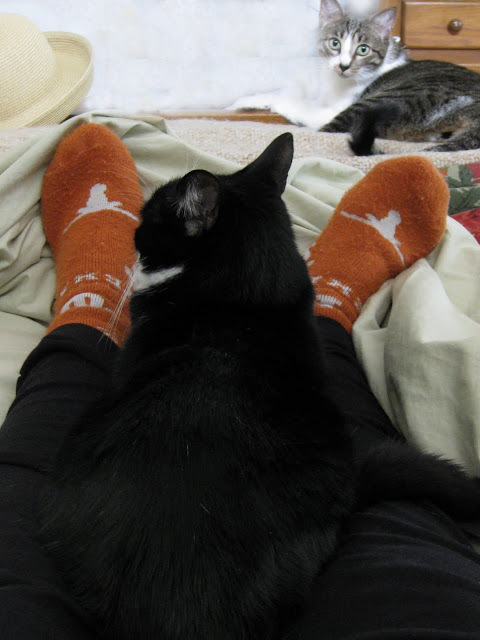 My cats, Benjamin(striped) and Franklin(black) would not leave my side. I believe they could sense something was different on those days. I stayed in bed a lot on Puny Thursdays. The side effects for Herceptin, my miracle drug, were minimal. Mostly I felt as if I was coming down with a cold. It is a monoclonal antibody that targets only the cancer cells, unlike standard chemo which targets all fast growing cells. So after 18 weeks when I only had infusions of Herceptin, my hair started growing back. There is a small chance for cardiotoxicity and I had to have a MUGA scan every 3 months to monitor my heart. 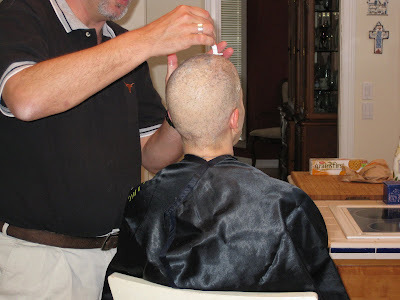 needed to go and I had already arranged for James, a very good friend to come by the house to do the shaving honors. Mark wanted to join me in solidarity but I said no. I could avoid a mirror if I wanted to, but every time I looked at his bald head it would be a reminder I did not need. James thought I would have a good cry after he left, but I didn't. Maybe it was because my pity party over the hair loss had already come and gone. I think the Pollyanna in me was returning because I kept reminding myself of all the money I was going to save on haircuts and shampoo. Also, showering & getting ready in the morning was so much faster!! Shortly after my fourth treatment on the last day of March, I got a call from my brother in Houston. Our 88 year old Dad had a stroke and he could no longer swallow. We made the decision to call in hospice. At the end of February I had gone there to help move him into a nursing home. His Parkinson's had progressed to the point where his caregiver could no longer take care of him at his home of 46 years. He passed away a few days later after the family was able to say goodbye. Dad knew about my cancer, but I never told him about the chemotherapy. I didn't want him to worry. I still miss his laugh and his twinkling eyes. He was my Hero. My fifth treatment was 10 days later. The stress of losing my father combined with a bad sinus infection made this one the worst so far. There was no gradual increase in the symptoms, it was like they tripled. The reason they give you the BIG drugs once every 3 weeks is to give your body time to recover. Well, #5 took the full 3 weeks. May 5th was the sixth and last treatment and I was dreading it. I woke up that morning thinking, "Okay, let's just get this over with." The fifth one had been awful and I was expecting this one to be worse. I even asked Dr. Kampe if he could just put me in an induced coma for the next 3 weeks. Nope, not possible! I longed for it to all be over, for life to get back to normal. Yet, it was hard to remember what normal felt like. In the infusion room, the routine began again as the nurse accessed my port for the IV. The chemicals started dripping into my veins. I thought of the Danskin Triathlon coming up in a month and had to chuckle. I remembered how "excited" I was the previous fall to become a survivor so that I could start right after the Elite Athletes this year! Back in January I had high hopes: My plan was to train for my 4th Danskin while going through Chemo. It turned out to be wishful thinking. ... Part V continued here "The Light at the End of the Tunnel"
You are beautiful and amazing and I'm so proud to be your friend. Love you! Just to let you know that although I said I'd comment after part two, I didn't realize that there was to be more. I'm reading every post and just want to say how much I admire the strength and courage you have displayed throughout your diagnosis and treatment. To have your father pass during your chemo and not falter in your own personal battle is amazing. You are amazing! Looking forward to Part V.